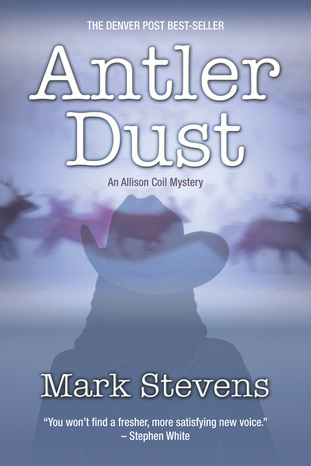 Antler Dust begins with a bang. Two bangs. The first is a hunting guide. The second is an animal rights protester who believes his creative suicide will galvanize the animal rights movement. Hunting guide Allison Coil hears a distant rifle shot and sees just enough through the swirling snow to believe somebody knows something-and isn't coming forward. Outfitter George Grumley fends off the formal investigation and works to discourage the informal and persistent inquiries by Coil. Grumley knows no limits in the effort to protect his guide service, which caters to fat-cat clients. Who needs hunting regulations when technology can produce the quickest and most thrilling hunt that money can buy? The Colorado Talking Book Library serves readers who have difficulty accessing standard text. CTBL recently completed (March, 2017) an audio version of Antler Dust. ​Click for a sample (right) read by Karen Cranford. And thank you, CTBL.